I had the good fortune to be asked to read Jamie Ford's Hotel on the Corner of Bitter and Sweet and my first thought when I finished the book was, "Wow." Career-wise, Jamie went to art school in Seattle to become an illustrator, and ended up an art director/copywriter. He's won an embarrassingly large amount of meaningless awards including 400+ Addys, 7 Best-of-Shows, and his work has appeared in Adweek, Advertising Age, Graphis and Communication Arts. He also had a commercial appear on an episode of The U.K.'s Funniest Commercials inspired by an embarrassing incident with a bidet that he'd rather not go into right now. On the writerly side, he won the 2006 Clarity of Night Short Fiction Contest, was First Runner-Up in the 2006 Midnight Road Reader's Choice Awards and was a Top-25 finalist in Glimmer Train's Fall 2006 Short Story Award For New Writers. He's been published in The Picolata Review, and his fiction is online at Flashing in the Gutters and Fictional Musings. He's also an alumnus of the Squaw Valley Community of Writers and a survivor of Orson Scott Card's Literary Bootcamp. Jamie's debut novel, Hotel on the Corner of Bitter and Sweet was released by Ballantine on January 27, 2009. On the personal side, he's the proud father of two boys and two girls. Yep, it's chaos, but the good kind of chaos. Whenever I finish a book like this, I never know how to write about it, only because I never know how to put down on paper the emotions that are churning through me when I finish the book. 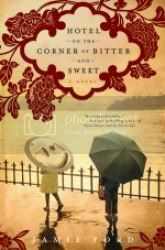 Jamie Ford's Hotel on the Corner of Bitter and Sweet is the kind of book that takes me there, into the story, completely. It transports me to that time, filling me with the emotions of the characters; their loves, their fears, their hopes. And hope is what this book is ultimately about. Hope and faith. And knowing that even though sometimes you will lose sight of that faith and lose hope entirely, it isn't always gone. The book is split between time; the "now," Seattle of the 1980s, and the "then," Seattle of the 1940s. The story opens with Henry Lee wandering by the Panama Hotel, where a stockpile of suitcases and personal belongings have been found in the basement of the hotel. These articles are from another time, a time that Henry thought was well behind him. Henry is Chinese, and has lived in this part of Seattle for most of his life. When he was a boy, his father and mother wanted him to be accepted as American, sending him to private school rather than having him attend the local Chinese public school. During his time at school, he meets Keiko Okabe, and the two become friends. The problem here is that Keiko is Japanese, and Japan is at war with both the United States and with China during this time, and Henry's father has forbidden any involvement with anyone or anything Japanese. Keiko was born in the USA, at the same hospital, in fact, that Henry was born in. She speaks no Japanese. She is fully American, but this makes no difference to Henry's father, or anyone else for that matter. She is Japanese, and therefore, the enemy. Henry and Keiko's friendship, and eventual love, transcend all these boundaries, and even though they are kept apart by Henry's families strict prejudices, they find ways of seeing each other outside of school. Eventually, the US government moves (or evacuates) anyone of Japanese descent to internment camps farther inland, for their own "safety," or because anyone could be a Japanese spy. Keiko's family is swept up in this "evacuation" and moved to their camp, where Henry, through an unlikely source, finds a way to continue visiting Keiko. Eventually Keiko and her family are moved farther inland, making impossible for Henry to continue visiting, but he writes faithfully every week, even when her letters are becoming fewer are farther between. Reading about the "evacuations" and the camps that the Japanese families were sent to made me embarrassed and angry to be American. That we would stoop to such lows was a shock to me. I guess not living during that time, I wouldn't understand the full emotions that everyone was feeling then, but to look back from now, I almost can't understand how something like that could happen. The word "unfair" kept going through my mind while I read these portions of the book. I found the interactions between Henry and his father, and then in turn, Henry and his own son very interesting. To see how Henry handles his father and his prejudices, and how he tries not to act the same way with his son, and yet falls into similar patterns, and how they cope with that. There are so many layers to this story, and each one opened an entirely new set of emotions for me. There is so much more than what I've described that goes on in the book, but I hate to give anymore away. The ending left me with goosebumps, and that's all I want to say about it. It may seem a little predictable toward the end, but it was still a perfect ending to this beautiful story, a story about faith and hope, families, and rising above the boundaries of simple race and heritage to become the person you are meant to be. I just finished this book today. Listened to it in the car. Talk about goosebumps! An amazing story indeed. Isn't it a wonderful book? I'm glad that you liked it. I was lucky enough to get this one as an ARC last Christmas and loved every single page of it. Absolutely fantastic! I'm so glad to here you liked it as well! I've linked to your lovely review here.